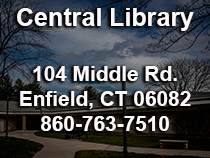 The Enfield Public Library offers Notary Services to our library customers. The cost is $5 per notary signature. We suggest that you call ahead to the library to be sure that a Notary is on duty at the specific time that you plan to use the service. There are no Notary Services offered during evening hours. 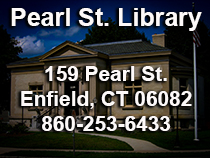 Library Notaries witness document signing or signing a sworn statement on a document. They verify, by their signature and seal, that you are who you say you are. A current passport from any country, in a language the Notary can read. A signed library or credit card. Birth certificates and Social Security cards are not acceptable ID. The person requiring Notary Services must be sure the document is completely filled out, leaving no blanks except where the signature is required. The library will only notarize documents written in English. The Notary must be able to communicate in English directly with the signer. If witnesses are required, please bring them with you. Notaries cannot certify copies of vital records such as birth, marriage and death certificates. Note that certified copies of these can be obtained from the issuing authority. Notaries cannot assess the mental state of the signatory. Notary Services are not available for wills or I-9 forms. Notaries cannot dispense legal advice. Notaries can refuse service at their discretion.